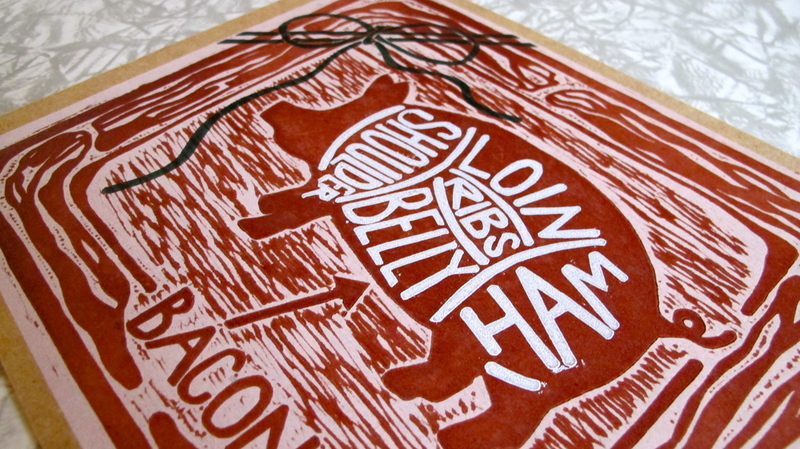 INSPIRED BY MY BROTHER'S LOVE OF BACON, THIS PIECE EVOLVED FROM AN ORIGINAL BUTCHER DIAGRAM TO AN ODE TO AMERICA'S FAVORITE SAVORY TREAT. USING FOUR HAND-CARVED, WOOD PLATES WITH DIFFERENT MIXED INKS, I PRINTED THIS EDITION ON ACID-FREE CHIP BOARD. ONCE THE PIG WAS CREATED, I HAD TO KEEP GOING WITH THE SERIES AND DABBLED WITH POULTRY: DRUMSTICKS TO BE EXACT. I USED THE SAME TECHNIQUE AS BEFORE, WITH FOUR CARVED PLATES, AND NEW, HAND MIXED INKS, PRINTED ON THE SAME CHIP BOARD. AND SO THE SERIES BEGINS...THERE'S MORE TO COME AFTER THE CHICKEN.